will be in each class the week prior to performances (Saturday June 3rd through Friday June 9th). No theatre dress rehearsal. Tickets will go on sale Saturday, May 6th 9:00am-1:00pm (CASH OR CHECK ONLY) at the Main Studio, back parking lot. Tickets will also be on sale in the office starting May 8th (CASH, CHECK or CC). If you do not wish to wait in line, order forms will be available to pick-up in the office from April 22nd onwards. Forms should be returned to the office with payment (CASH or CHECK only). On Saturday May 6 at 2:00pm, the best seats available will be attributed based on the order the forms were received. Sign-up for awards will be in the office, or you may email Carolyn. Please indicate which show you will be receiving your award by May 10th. Not having your name called on stage can be very disappointing. If you are to receive an award, please come backstage toward the end of your show. Class photos taken during dress rehearsal week in regular class times, Saturday June 3rd through Friday June 9th levels three & below. Requests for a class photo for students levels four and above should be made via email to the MPAD office. Studio tote bags and flowers will be for sale in the lobby at the recital. Flowers can be pre-ordered and paid in the office. All flowers may be picked up on the day of each show in the lobby. The proceeds benefit the Competition Team Scholarship Fund. Please help support our team! 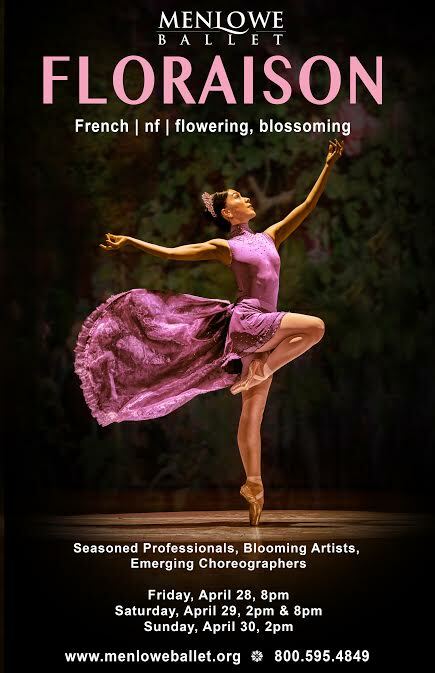 Menlowe Ballet, our local professional ballet company performing at the Menlo-Atherton Performing Arts Center, announces its spring season, April 28-30! FLORAISON celebrates artistry unfolding within our ranks with a world premiere by Michael Lowe & Sarah-Jane Measor performed by our seasoned company professionals to the music of Philip Glass, a new contemporary work choreographed by company dancers Stefanie Maughan and Ali McKeon, award-winning performances by aspiring dancers from Menlo Park Academy of Dance, and the return of Ms. Measor’s powerfully poignant Portraits honoring real women in history who have touched the world with their courage and creativity. Don’t miss this spectacular season! Tickets are on sale now! HOP TO IT! SPECIAL DISCOUNT FOR FLORAISON TICKETS NOW! From now through Easter Sunday, all Studio Families will receive an exclusive 20% off each ticket to see Floraison! This offer is good for all shows. Please use discount code MPAOD at checkout. Hurry… get your tickets now before the discount expires at midnight on April 16! 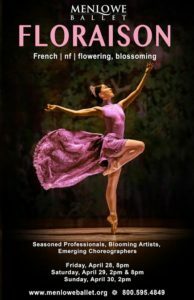 www.menloweballet.org or by calling 800-595-4TIX (4849). MPAD Summer Intensive for Intermediate and Advanced students will be June 12th through June 23rd, 2017. 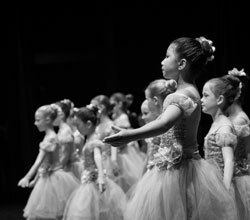 The Intensive offers elite instruction in classical ballet technique, pointe, variations, pas de deux, contemporary, jazz and African dance. Lectures and Q & A sessions covering a variety of dance-related topics will be offered. The program culminates in an on-stage performance that family and friends can attend on June 23rd. MPAD JUNIOR INTENSIVE will take place June 26th-July 1st, 2017 and and MPAD SUMMER CLASSES July 10th to August 12th, 2017. Sign-up online mid-April. Please join us for another exciting summer!